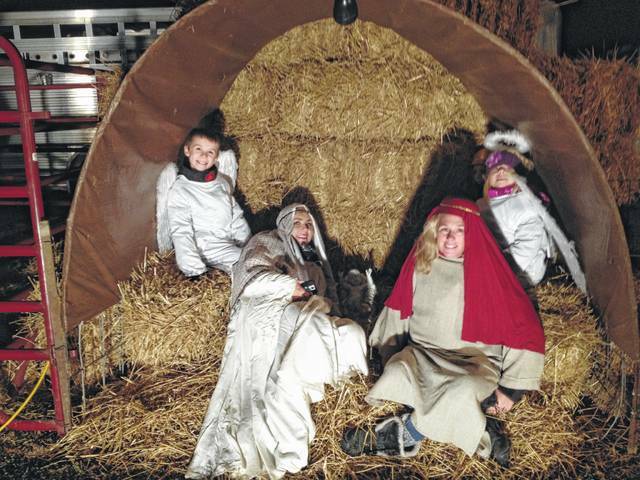 During the annual Christmas in Ashley event, local children will dress up in costumes for the live nativity on High Street across from the Methodist church. The event is scheduled for Saturday, Dec. 2 from 6 to 9 p.m.
Mark your calendars for Saturday, Dec. 2 because Santa and Mrs. Claus are coming to the eighth annual Christmas in Ashley. Festivities can be enjoyed from 6 to 9 p.m. beginning with Santa riding down High Street on a firetruck in a parade to the old Ashley Methodist Church where Mrs. Claus will be waiting for him, according to organizers. Charles Miley and Donna Mitchell reprise their roles again this year as Santa and Mrs. Claus. Once the parade ends, the carolers will walk through the village singing to lift the Christmas spirits of the villagers. Christmas in Ashley began when Amy Ruggles, chairperson of the committee for the event, thought it would be fun to have a live nativity scene in the village to bring people together. The live nativity will be staged across from the Methodist church on High Street again this year. The Ashley Library will place a box for toy donations next to the display. The Town Crier, played by Scott Shoemaker, will roam the streets ringing his bell as a guide for scavenger hunters on their journey from the Elm Valley Joint Fire District station at 3 N. Harrison St. to Ashley Wesleyan Church on High Street. Prizes donated by local residents and businesses will be awarded. McFarland said there will be cash prizes awarded in the amounts of $150, $100, and $50 for the top three best exterior lighting of a house. She said the judging will happen the day before the event on Dec.1 and all homes are eligible in the village. The cash and prizes were donated by local businesses. McFarland said five of the historic homes of the village will be decorated and open to the public for tours. The owners will explain the history of the house and the past owners. The homes that will be open are located at 241 West High Street, which was built in 1862; 527 East High Street, built in the late 1800s; 219 East High Street, built in the 1800s by a shipbuilder; 205 East High Street, built in 1860 by a whiskey barrel maker; and 216 East High Street, which is built in the style of a farmhouse. McFarland said the sidewalks will be lined with hundreds of luminaries that will be placed by the local Boy Scout troop. McFarlane said the businesses of Ashley will be open during the event. Other activities include a fish fry at the American Legion and Christmas music played on a 100-year-old pipe organ at the Methodist church. Cookies and wassail will be provided and a Dickens Christmas Village will be displayed at the First Commonwealth Bank.